Dr. Jennifer Hauler, left, is chief medical officer for three Ohio hospitals that are part of Premier health. Dr. Jennifer Hauler, an osteopathic physician, was juggling several leadership roles in 2014 when she decided to get an MBA. In addition to serving as medical director at a Kettering Health Network free-standing emergency room in Huber, Ohio, Hauler was the secretary treasurer of the Ohio Osteopathic Association and treasurer of the medical executive committee for Grand View Medical Center in Dayton. Hauler applied to Indiana University's Business of Medicine Physician MBA program because it was tailored exclusively for professionals like her: practicing doctors. The two-year program, which launched in September 2013, addresses all the core curriculum students get when they receive an MBA. Healthcare organizations want more physicians in their C-suites. But getting potential leaders the right training and the proper skill mix may take more than additional schooling. But their focus almost always had a healthcare twist. One class called Healthcare Revenue Delivery Models addressed accountable care organizations and bundled payments. The physician-tailored master's program at Indiana University is just one of dozens that have popped up in recent years as the financial success of hospitals and health systems becomes more closely tied to clinical outcomes. This shift has encouraged senior C-suite leaders and boards of trustees to look to physicians for guidance and leadership. More physicians recognize that they bring invaluable insight to leadership teams, but they also know that to be a change agent they need to understand business operations, Giella said. 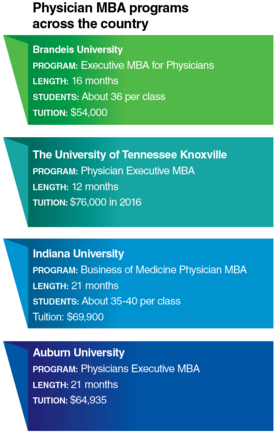 As a result, some physicians seek out educational opportunities beyond their medical degree, enrolling in master's programs focused on business and health administration. Physicians are the ACHE's fastest growing membership segment, with a 10% increase in just the past year. More than 2,000 of the organization's 38,000 members are now physicians. In addition, enrollment at the ACHE's longstanding physician education platform has doubled since 2013, Bowen said. The organization offers seminars, networking opportunities and online tutorials to its members. Bowen said healthcare executives recognize physicians are key strategic partners and they want them to have the knowledge to effectively contribute to the organization. “Leadership is about working together,” she added. Eagerness by administrators to engage physicians at the strategic table is relatively new. When Harvard launched in 1999 its Master in Health Care Management program, which exclusively enrolls working doctors, there wasn't much interest by leaders to register their physicians, said Nancy Kane, professor of management in the department of health policy and management. Many CEOs said “we don't want our physicians to be leaders, we want them to be clinicians,” she recalled. This attitude of shutting out physicians for leadership opportunities started decades ago. As hospitals opened in U.S. cities and towns during the late 19th and early 20th centuries, they were often formed and run by physicians. 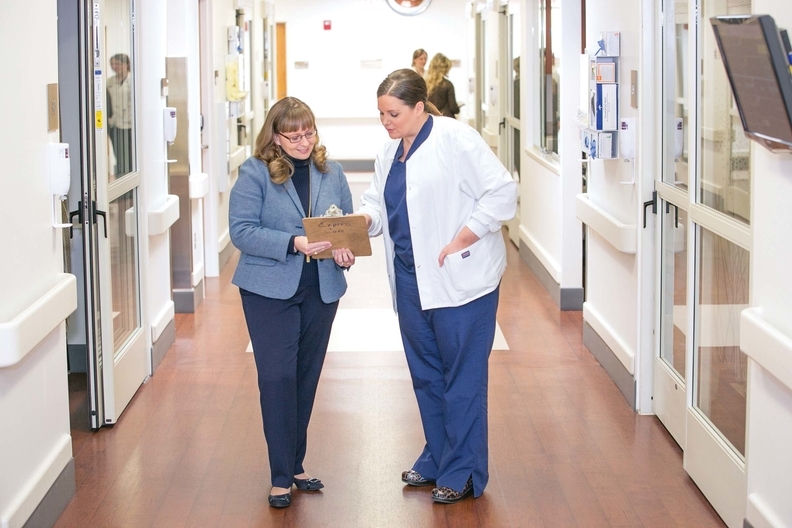 But as the organizations grew in complexity and beyond the ability of physicians to manage effectively, leaders trained in traditional business skills began to dominate hospital leadership. Today, hospitals are still dominated by business leaders. A 2014 report by the American College of Physician Executives found only 5% of hospital leaders are physicians. But that is changing, experts say. “There is clearly a need and desire for physicians to be in leadership,” said Bob Clarke, CEO of executive search firm Furst Group. He said the industry will “absolutely” see an increase in physician CEOs as a result. The value that physician leaders bring can be seen at some of the nation's most prestigious healthcare organizations. Respected institutions like the Mayo Clinic, the Cleveland Clinic, Geisinger Health System and Partners HealthCare are all led by doctors. “The hospital enterprise isn't just about the money; it is about the patient outcomes and the quality of care. You need a doctor,” Kane said. The fact that more doctors are directly employed by hospitals may also be driving the push for more physician leaders. Administrators and doctors are now more strategically “aligned” to take on quality and cost initiatives together, said Julie Riley, senior consultant at the Advisory Board. In this shifting reimbursement climate, providers have taken on innovative strategies to control spending. Organizations are making efforts to streamline care. They are also implementing population health, outpatient clinics and home-care services. These delivery models can ease costs but clinical input is critical to their execution. Additionally, initiatives to achieve those goals led by a well-respected doctor would be much better received by other physicians than one led an administrator who lacks clinical experience. “Physicians understand the environment that is beneficial and they have far greater credibility and greater trust” among colleagues, said Amanda Goodall, a senior lecturer at the Cass Business School in London who has studied physician leaders. For these reasons, more hospital and health system boards want a physician in the C-suite either as the CEO or the chief clinical officer, a relatively new role that is becoming more common at large systems, Riley said. Unlike the chief medical officer, a C-suite role held by a physician, the chief clinical officer's responsibilities are much more strategic, Riley said. Whereas the CMO is largely responsible for engaging physicians, the chief clinical officer will help an organization determine, for example, if an acquisition is clinically beneficial. But it's “difficult to find these chief clinical officer leaders,” Riley said. The role requires deep knowledge of medicine in addition to business skills a physician doesn't traditionally get in medical school. As a result, many large organizations have made investments to foster a pipeline of leaders with business skills. Sometimes this will be in the form of in-house programs. In some cases the organization will pay for a physician to get an MBA or MHA degree. An estimated 40% of the 300 alumni of Harvard's program received financial support from their healthcare organization, a 2016 survey found. A portion of students at Indiana University also receive financial support from their employer to complete the Business of Medicine Physician MBA program, said faculty chairman Anthony Cox. MBA and MHA programs also have limitations. They give physicians business skills but often not leadership ones. This has made accreditations programs appealing alternatives, said Dr. Peter Angood, CEO of the American Association for Physician Leadership, which has a robust, 20-year-old accreditation program for doctors. Compared to MBA programs, physicians report accreditation, which physicians can pursue at their own pace, is “more practical, solutions oriented and reflective of the real world,” Angood said. More than 3,000 physicians have received AAPL certification. The Executive MBA for Physicians program at Brandeis University has sought to impart leadership skills by creating classes on Lean process improvement and how to motivate staff when new initiatives are implemented. “We want them to be a player (and a) coach,” said Jon Chilingerian, founding director of the program. A doctor with a mix of leadership and business skills is an invaluable asset to an organization, Chilingerian said. It's important for healthcare organization to recognize this, making educated physician leaders “an ingredient of health reform,” he said.